In the previous post I explained how I learned the identity of the building in Mother’s (Marion Gunderson) watercolor of Iowa State University’s heating plant. Mother’s notes indicate she painted the 1951 watercolor “From charcoal sketch done while at ISU.” She was a student at Iowa State during the period of 1937-1941. In other words, there was at least a ten-year span between when she created the charcoal sketch and when she painted the watercolor. I wondered what Mother’s vantage point might have been as she created her sketch (later used as the reference for her watercolor). In an effort to learn more about the vantage point, I contacted Jeffrey Witt, Iowa State’s Assistant Director of Utilities. This painting [immediately above] appears to have been done looking south and east towards the power plant from the north side. We do not have any photographs of the plant from this perspective but there may be some in the Special Collections section at Parks Library. I was able to find two views of the plant from that general timeframe and one a few years later. 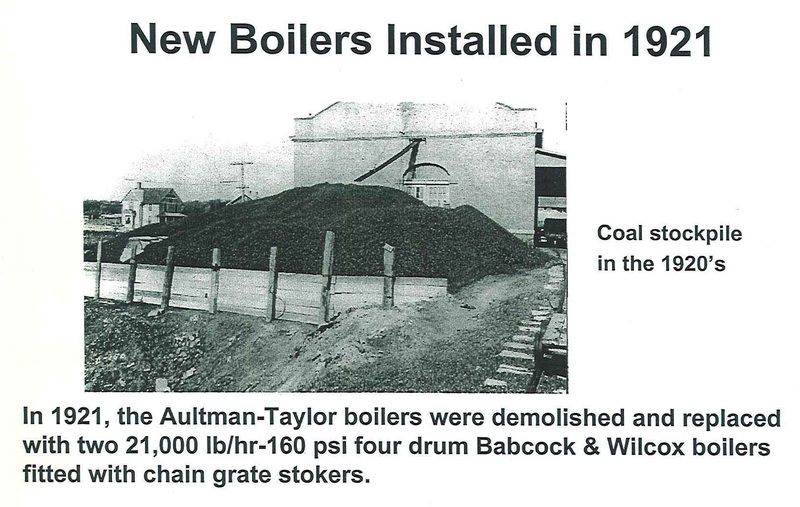 These [below] are scans from a historical account of the power plant put together by one of our staff. The first picture [immediately above] is looking at the plant from the east looking west. This photograph was before the large concrete smokestack was constructed. 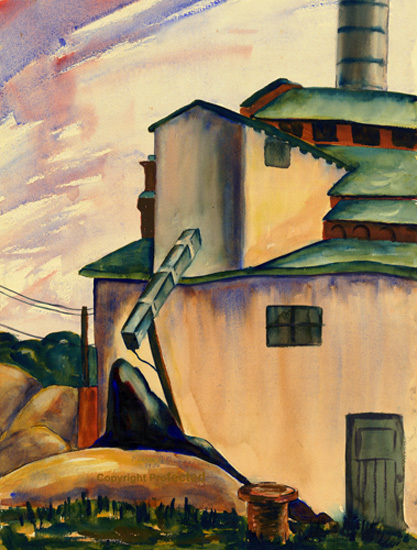 The concrete smokestack shows in the background of the painting. The second picture [immediately above] is looking at the plant from the south looking north and a bit west. We believe this picture was taken in the 1930s about the time the sketch was done. The third picture [immediately below] is an aerial view of the plant from the north and west looking southeast and was taken in 1954. The plant had a major addition in 1948-49 so it looks different than the previous pictures. It looks to me like the artist may have done the sketch while standing in the vicinity of the 4 white oil tanks that show in the foreground of this picture. The power plant depicted in the sketch and painting was built in 1906 and includes an addition in 1914. The facility would have looked similar until 1948-49 when it was modified to look like the 1954 picture [immediately above]. Another major addition was added to the south in 1968 and a 3rd major addition to the north in 1986-87. 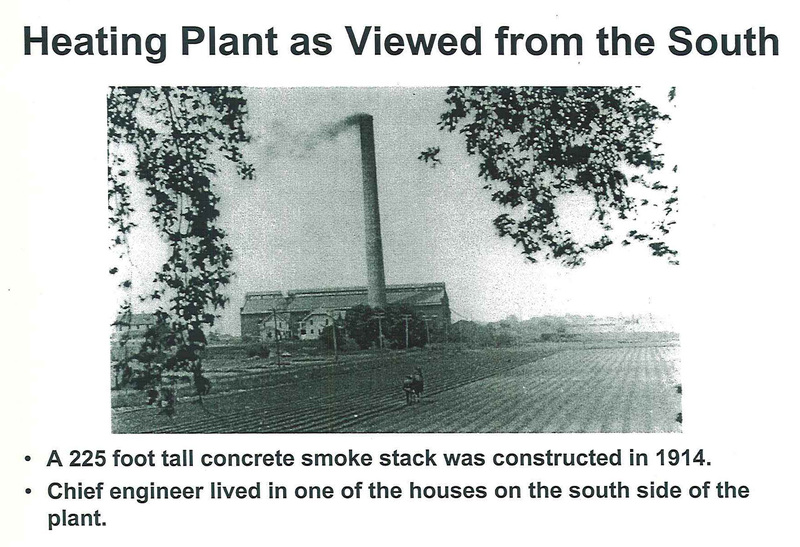 Over the years we have built on all four sides and on top of the original 1906 power plant. 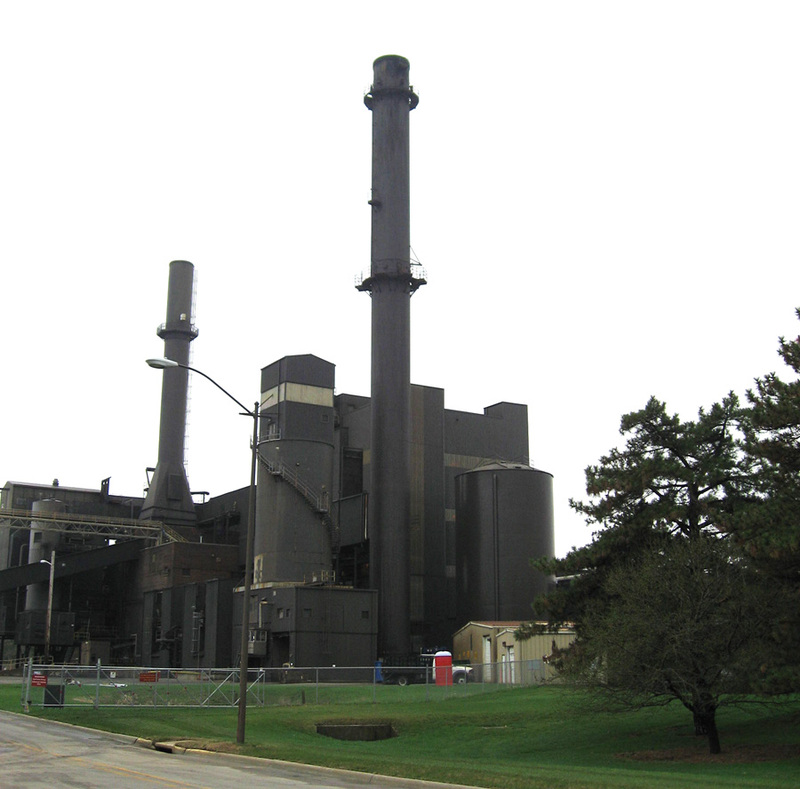 The original power plant supplied steam for heating and electricity for the campus. 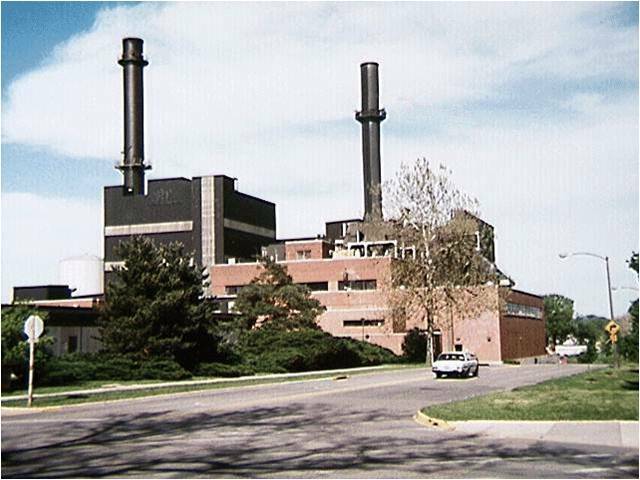 Today’s power plant still provides heating steam and electricity and we started providing all the cooling for campus with the addition in 1968. "Photograph for your reference" of current power plant. **In the photo at this link, the “green” storage shed looks more yellow/tan. In reality, it is green. 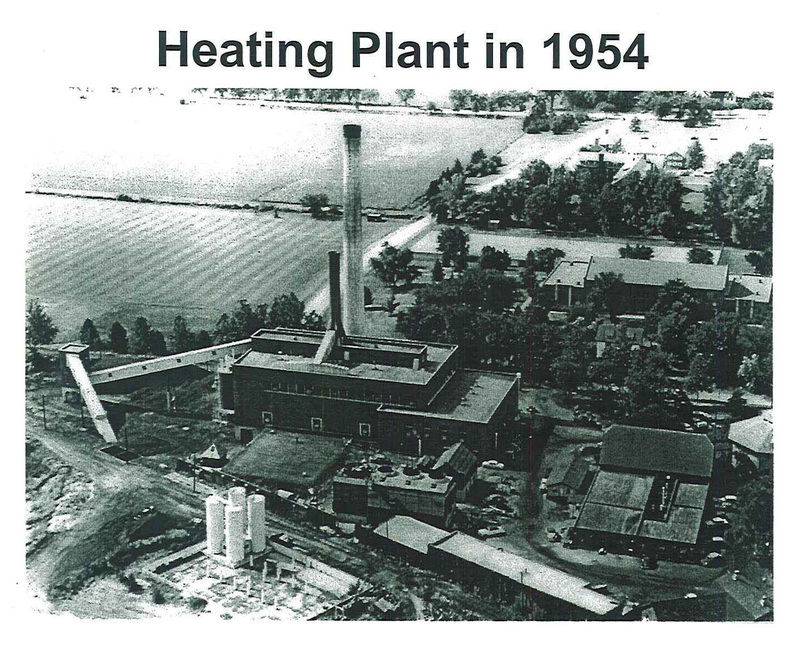 ***In the next post I’ll include web sites providing more information about the heating/power plant. This entry was posted on June 7, 2010 at 10:58 pm and is filed under Uncategorized. You can follow any responses to this entry through the RSS 2.0 feed. You can skip to the end and leave a response. Pinging is currently not allowed. How exciting!!! What *great* sleuthing, Nancy!!! I especially love the part about the green metal shed! And what great reporting, Lois! Did you not tell J.W. who the artist was?